You can also Visit our office between 7.30 am to 11.30 am from Monday to Friday. Wel Come to GOOD MORNING KIDS play school. 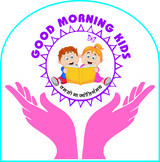 One of the best play school in India, Good Morning Kids works with a beleif that "Teaching / Learning is not a business, its the sentiments, dream and future of the children, parents and our country" hence We have made this Organisation "THE MOST AFFORDABLE SCHOOL" with a zeal to grow with a big name and outstanding performance. The School is formally Inaugurated by :Mrs.Beena Srivastava,W/O- Dr. K C Srivastava (Director D A V PUBLIC SCHOOL,DHANBAD ZONE.) On 10th February 2014. GOOD MORNING KIDS play school is started on Nov 2013 by a lady Mrs. Utpala Choubey who is Post Graduate in Economics followed by B.Ed and TET. A resident of Dhanbad district at Jharkhand, with a vision of providing cost effective education to the children of various society. Mrs. Choubey works herself continuously to fulfill the commitment. Good morning good morning,how do you do ? Good morning good morning, Im fine thank you. We come from many places, Good morning good morning. With happy smiling faces, Good morning to you. The sunshine we are bringing,Good morning good morning. So lets start up by singing, Good Morning to you. * Play group : 2.5 yrs. * LKG : 3.5 yrs. * UKG : 4.5 yrs. Contact us: +91- 7654446000, 9955919660, (Mon to Fri) ** Transport facility available.